Today Mentoring Mondays is all about the Disney Vacation Club, the reigning expert is Kristen Kirk-better known as the DVC Mom. I will be honest, before contacting Kristen I knew little to nothing about the DVC. She was recently featured on Babes In Disneyland Blog concerning the DVC, you can find it here. I now feel educated, and I am seriously considering joining. Kristen , thanks so much for sharing your knowledge with us! Hi Kristen! I am so excited to have you here. Please introduce yourself and tell us a little about your expertise in the Disney Vacation Club. Thanks so much for having me today Donna, it’s a pleasure to share my passion for the Disney Vacation Club (DVC) with you and your readers. I have been a Disney Vacation Club Member since 2008, when we bought a membership for my birthday and it truly changes our lives. I currently own at two DVC resorts; in Walt Disney World, I call Animal Kingdom Lodge’s Kidani Village home and at the Disneyland Resort, home is the Villas at Disney’s Grand Californian Resort and Spa. I have worked closely with my DVC Guide in bringing new families to DVC and have co-hosted events at the Doorway to Dreams Center to introduce Chicagoland mom bloggers to the Disney Vacation Club. What is the process for joining the DVC? For the majority of members, their first contact with the Disney Vacation Club is through booths and kiosks sprinkled around Disney Parks and Resorts. These kiosks are staffed and offer guests a brief overview of the Disney Vacation Club and afriendly cast member to answer questions. While you’re at a kiosk, the DVC Cast member can set up an appointment for you to tour models of DVC Villas and visit the main sales center. You will then spend a couple of hours (depending on your interest) at the sales center seeing the models and watch a presentation as well as talking one on one with a DVC Guide. The Guide is your go-to contact for purchasing a membership in the Disney Vacation Club. They will be able to answer all of your questions in detail and get you started on your property purchase. Your Guide, though a salesman, should help to match the best DVC options for your family. They can help you decided how many points you need and at which resort you should purchase your points, as you will likely have more than one opition. Membership in the Disney Vacation Club is the purchase of a real estate interest and as such comes with quite a bit of paperwork and is subject to various local laws depending on your state of residence. Your Guide will go over all of this with you during the process. I cannot stress enough how much I believe that you should feel a raport with your Guide. If you feel pressured by the Guide talking to you, feel free to ask for another. Remember that you can always say no during your tour and then call back and make the purchase after you get home. Disney Vacation Club handles long distance purchases all the time. My Guide, Laurie Bailey, is spectacular and works very hard and making sure what she is selling to members matches their family needs. She’s not only a cast member, but a true Disney fan. If you want to be a DVC Member, but didn’t click with the sales person that you talked to, please, please conact me at dvcmom@gmail.com and I will connect you with my Guide. She works with long distance purchases, and is truly the best. In your opinion who will the DVC benefit most and why? Financially, the people who benefit the most by joining DVC are those folks who already stay at the deluxe resorts at least once a year, and plan on doing so into the forseeable future. They will reap the biggest savings in the long run. However, I have never been one to measure the benefits of the Disney Vacation Club by the money savings alone. My personal experience has shown the biggest benefit to being DVC members has been an increase in our quality of life. DVC allows me quick and easy booking through member services, with the security of knowing my hotel room has already been paid for (for the next 40 years). 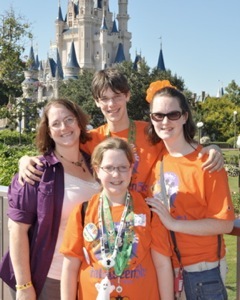 It allows my family the ability to travel more frequently than we did prior to becoming DVC Members. Because of that, DVC gives us more time to spend together as a family creating some of the most magical memories ever. The flexibility of the program will continue to be a benefit far into the future as our family grows and changes; the rooms that we book will continue to meet our needs. Can you use your DVC points at any Disney Park? You can use DVC points to stay at Disney Park Resorts around the world. You can also use DVC points on the Disney Cruise Line, Adventures by Disney, a number of non-Disney resorts in major cities (called the concierge collection), and over 500 RCI rental properties around the world. How does the DVC affect someone who wants to use the Disney Dining Plan or a Magic Your Way package? DVC Members booking a reservation on points don’t have a package per say. However they do enjoy the benefits of staying at a Disney resort the same way as other resort guests would, with the exception of limited housekeeping. DVC Members are able to make reservations for Magical Express, add any of the the dining plans, travel insurance and special events reservations all through members services. Members enjoy special pricing on events like Mickey’s Not So Scarey Halloween Party, Food & Wine Festival Tastings, Annual Passes, Tours and Recreation to name just a few. Once you have purchased your points do you have a time frame in which to use them? DVC Members get points dropped into their account once a use year. For instance, my DVC use year starts in December, so 185 points drop into my member account every December 1st. I can use those points during the next 12 months, or I can “bank” them forward for one year. If I bank points forward I move them to the next use year. Once points are banked they can not be unbanked, and the decission for my use year must be made before July. So if I’m not going to use my points from December 2011, I have until July to bank them to 2012. Once banked, I can’t do anything with those points until Dec 2012. DVC Members are only allowed to keep one year of points banked, so those points would need to be used before December 1st 2013. Are your points connected to a particular resort, or can you choose at the time of booking? The answer to this is really “both.” You purchase your points at one resort and this is your “Home Resort”. You are able to book a room at your home resort starting at 11 months out from your vacation date. At 7 months out, you can book at any other DVC Resort. This allows members to be sure they get a room on the dates that they want by booking at the resort which they have ownership. Once you have a room at your resort, you are welcome to try and change it to a different resort after the 7 month mark if you would prefer to stay elsewhere. Please explain “renting” value points and how it works. When members can’t use their points before they expire, they will sometimes rent them out to non-members for between $11-15 per point. This allows non-members to experience a DVC Resort without having to purchase points on their own while making sure that the owners investment is not wasted. Many non-members have found that they’re able to can stretch their resort dollars further by renting DVC points directly from members. These transactions are private contracts that occur between two parties requiring a fair amount of trust on both sides, and should be entered into at your own risk. I haven’t had any “extra” points yet, so I don’t have personal experience with renting. I frequently refer people to http://www.dvcrequest.com/ when asked about point rentals & information. What is your favorite place to meet Disney Characters? I am really not fond of standing in line for anyone but Mickey Mouse. For me, character dining is the best opportunity to get some time, photos, and autographs with a number of characters. Sometimes I will book several character meals in a trip so that we can see a greater variety of characters. Cape May Café at the Beach Club resort holds my favorite character breakfast. My number one tip for families headed to Walt Disney World is to not think you’re going to be able to see and do everything in one vacation; You just can’t. We like to have one “must do or see” in a day and after that, whatever happens happens. It’s vacation! Relax and enjoy yourself! There’s always another vacation to plan. Thanks for all the great info, Kristen! We have gone back and forth on purchasing into DVC and have yet to commit. I think we really need to sit down with someone next trip to see how it would work out for us. As our children are getting older (and we are a family of five), our options for resorts is limited. By the way, Cape May is our favorite character dining spot too! I'm always happy to talk with people about DVC! If you have any questions at all feel free to email me dvcmom (at) gmail (dot) com and we'll figure out how and if DVC can work for you! Since my three kids are teens now, having a two bedroom villa is a godsend when we all travel together. I love the idea, but it just doesn't make sense to us.. we rarely stay Deluxe and often stay off property when we need the extra space... but man, I love the idea! Jenn, thanks for stopping by. I have to admit I have thought about staying off property simply because of the savings. I am in the same boat as Beth, my biggest hurdle is talking my hubby into it!